The Space agency just completed a series of successful demonstration tests of the Kilopower nuclear power system that will be an essential part of future missions to the Moon and Mars. NASA authorizes the use of PU-238 as a power source in future multi-mission radioisotope thermoelectric generators, or MMRTGs, for deep space science missions throughout this decade. The Kilopower experiment was conducted at the NNSA’s Nevada National Security Site from November 2017 through March 2018. NASA officials said they expect the Kilopower project to be an essential part of lunar and Mars power architectures as they evolve. Kilopower is a small, lightweight fission power that uses passive liquid sodium for heat transfer to stirling engines which produce electrical power. The system as tested is capable of providing up to 10 kilowatts of electrical power – enough to run several average households – continuously for at least 10 years. Four Kilopower units would provide enough power to establish an outpost on the moon or Mars. According to Marc Gibson, lead Kilopower engineer at NASA Glenn, the pioneering power system is ideal for the Moon where power generation from sunlight is difficult because lunar nights are equivalent to 14 days on Earth. “Kilopower gives us the ability to do much higher power missions, and to explore the shadowed craters of the Moon,” said Gibson. The prototype power system uses a solid, cast uranium powered reactor core. Passive sodium heat pipes transfer reactor heat to high-efficiency Stirling engines, which convert the heat to electricity. The team took the design through a full power 20 hour test. The objective is to work towards certification of the power system for space flight. The Kilopower team conducted the experiment in four phases. The first two phases, conducted without power, confirmed that each component of the system behaved as expected. During the third phase, the team increased power to heat the core incrementally before moving on to the final phase. The experiment culminated with a 28-hour, full-power test that simulated a mission, including reactor startup, ramp to full power, steady operation and shutdown. Such a demonstration could pave the way for future Kilopower systems that power human outposts on the Moon and Mars, including missions that rely on In-situ Resource Utilization to produce local propellants, water, oxygen, and other materials. The Kilopower project is led by NASA Glenn, in partnership with NASA’s Marshall Space Flight Center in Huntsville, Alabama,and NNSA, including its Los Alamos National Laboratory, Nevada National Security Site and Y-12 National Security Complex. 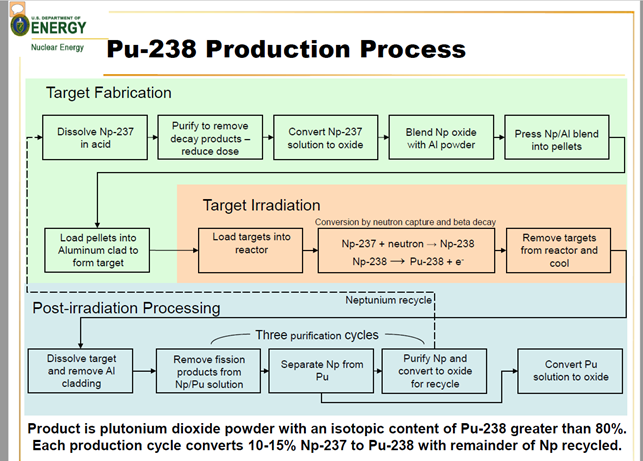 (SpaceNews) Citing progress in producing plutonium-238, NASA will allow scientists proposing missions for upcoming planetary science missions to use nuclear power sources for electricity to run scientific instruments. In a statement issued March 17, Jim Green, director of NASA’s planetary science division, said the agency has reversed an earlier decision prohibiting the use of radioisotope power systems for spacecraft proposed for the next mission in the agency’s Discovery program. Planning for the next Discovery mission is still in its earliest stages. NASA plans to release a draft announcement of opportunity in September 2018 for comment, followed by the final announcement in February 2019. NASA will select finalists for further study in December 2019, with a winner chosen in June 2021 for launch no later than the end of 2026.